Vince Comerford, (born) in Buffalo, NY on December 27th of 1961, (died) on April 10th of 2014 to the amazement of his fan base. Reportedly, Vince was sleeping in the break room of a Peoria, Arizona fitness facility when others found his lifeless body. Witnesses stated that CPR was unsuccessfully administered by other gym staff members prior to the arrival of paramedics. Comerford (aka THE BLOND MYTH) was most active during the late 1980s and 1990s bodybuilding scene along with other bodybuilders including Shawn Ray and Nimrod King. Before his death, rumors circulated of Vince’s declining health and persistent heart issues. Today, blogs are more willing to attribute Vince’s demise to the ultimate heart attack that his friends always feared. 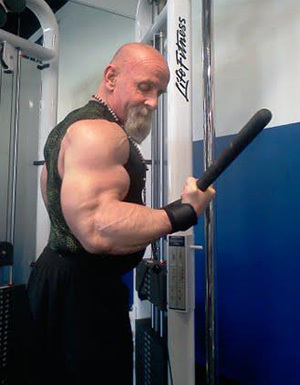 Theoretically, a recent photograph of Vince performing reverse triceps-extensions at the cable station (shown below) reveal his continued interest in a steroid/hgh based bodybuilding lifestyle. As a reflection of love and respect, many followers commented that Vince Comerford “…had the heart of a giant.” As has been the case with other bodybuilders who’ve died prematurely, it is too bad that, as a result of something as counter-intuitive as non-medical steroid use, his giant heart failed him.